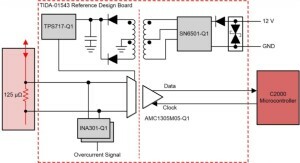 This reference design provides detection of traction motor phase currents. 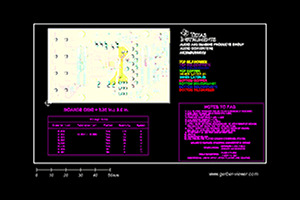 The TIDA-01543 design realizes an isolated current sensor solution. Precise in-line huntbased, motor phase current sensing is done with AMC1305M05-Q1 delta-sigma (ΔΣ) modulators and the INA301-Q1 device. The high CMTI of the modulator helps suppress inverter switching transients from corrupting the data on the controller side. The fast response time of the INA301-Q1 enables faster reaction times for overcurrent events. The TIDA-01543 provides an interface to connect to an external MCU where digital SINC filters can be implemented to demodulate the AMC1305M05 output bit stream. This TI Design uses the C2000 family, automotive-qualified F280049M Piccolo™ icrocontroller control card.